U.S. stocks rebounded from two days of selling on Friday, but still recorded the strongest weekly performance in over a month. Friday’s rebound was sparked by comments within Fed Chair Janet Yellen’s Jackson Hole, Wyoming speech which were not as hawkish as many economists had expected. The euro reached a two and a half year high against the dollar in relief that European Central Bank President Mario Draghi did not decry the currency’s valuation in his Jackson Hole speech. Equities soared on Tuesday after President Trump’s top economic advisor, Gary Cohn, said he expects tax reform measures to pass this year and confirmed he has no plans to resign in protest over the president’s reactions to recent violence in Charlottesville, Virginia. Wall Street also kept an eye on Hurricane Harvey, which was expected to make landfall near Rockport, Texas on Friday night. For the week, the S&P 500 rose +0.75%, the Dow Industrials gained +0.64% and the MSCI EAFE (developed international) advanced +0.61%. Bitcoin was created in 2009 as the world’s first cryptocurrency and is up 620% in dollar terms over the past three years, garnering attention from investors. While this has clearly made bitcoin a highly profitable short-term investment, in the long run, cryptocurrencies like bitcoin were created to act as a currency, and they have yet to prove their capability. Standard economic theory states that money has three functions: a medium of exchange, a store of value, and a unit of account. As a medium of exchange, it is hardly used to facilitate transactions: only three (3) of the top 500 online retailers accept bitcoin in 2017. As a unit of account, suppliers and purchasers must be able to attribute a value to their goods and services in terms of bitcoin. With low adoption amongst retailers, they are not inclined to take on that risk. As a store of value, bitcoin again fails: as Chart 1 illustrates, the monthly price movements of bitcoin are far more volatile than that of the U.S. dollar with average monthly price moves in excess of 10% in either direction. 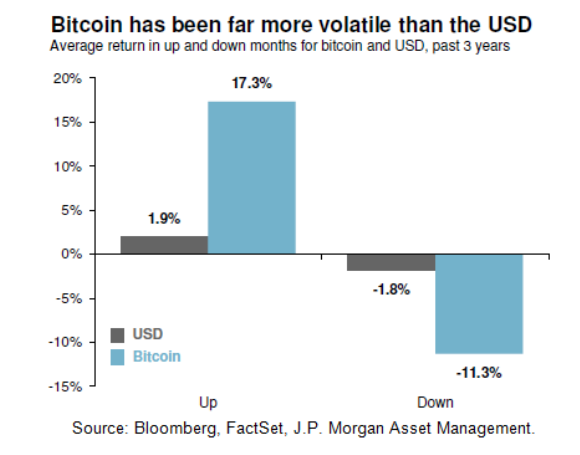 According to J.P. Morgan, while bitcoin may see further price volatility in the near term, its shortcomings as a currency cast a shadow over its long-term prospects.